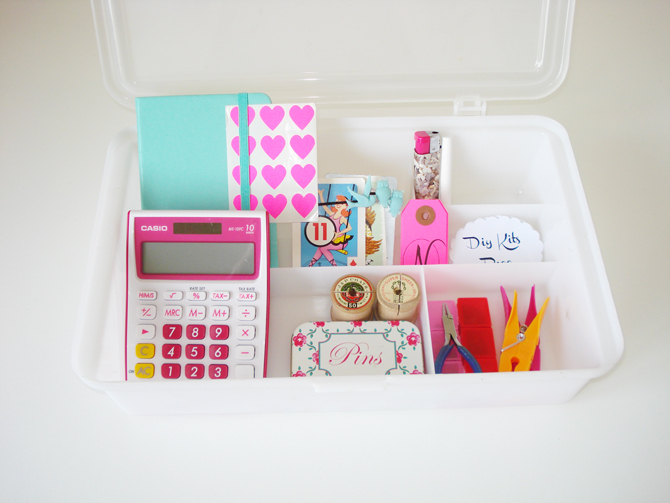 I found this box with compartments at Checkers (I love a good random find) and it is just what I need to house all the goodies to feel organised and run my stall in the best way possible. Notebook or Order Book: Necessary for taking down special orders or requests. Also great to capture a good idea that might pop into your mind mid-market. Calculator: I like to stretch my brain a bit and calculate in my head, but some days I need a calculator. Keep one in your kit to ensure you always give the right change and to ensure you are adding your valuable sales accurately. Tags and Price Labels: Keep extra tags in case you need to relabel a product. Price labels also ensure that potential shoppers who are shy can see a price without having to ask. A display board of prices is also a good idea and more permanent. The old cotton reels you see have a slit in them and hold my price labels in a cute way that matches the theme of my stall. Pegs, Pins and Prestick: Any market stall holder will tell you that the weather can change faster than you can say windy! I keep these in my kit to hold down what I can when the wind picks up. Prestick is also good to hold display details in place. Scissors: For stray threads or to cut washi tape I use to seal packets. Lighter: Random, I know, but I use it to ensure all ribbon edges are perfect, I can't stand fraying ribbon. Chalk: I have a wooden counter box that I use and it is painted in chalk paint so I write and draw on it. Stickers, Tape and Cute Packaging: I love making sure that each bought item leaving my stall is like a gift to the buyer. I ensure that all my packets are branded for a lasting impact and then I use tape or the heart stickers from Knot and Bow to wrap it. Freebies: I keep a few of my birdie clips in my kit as they are one of my cheaper products which I like to giveaway to repeat customers, someone I want to impact or say thanks to. You don't need to be handing out free products with everything, a well placed small item can really make the right impact though. It is even handy to do a few versions of your business card packaged up in a cute envelope with something sweet inside. See this post for more inspiration. Tools of the Trade: I take pliers and product bits and pieces along. If the market is quite you can crack on with some making or if something needs repairing you can ensure it is perfect before sale. Each crafter will have different tools, but one thing I know is some market shoppers like seeing the creation process, just make sure to look up now and again and to engage with potential buyers. Business Cards: Super, super important! Don't go without these, if you have a new business invest in these asap. Be sure to put a few on display for shoppers to take. Pens: To write orders down and to keep my market sales sheet up to date. I also like to make sure I have plenty of water and sunblock! You can download my useful market sales sheet to capture your sales, float and which event you are taking part in. Just click here. It is crucial to keep track of sales and this sheet is easy to file away and reflect back on as you continue on your market moneymaking journey. What are some of your essentials for doing a market? Your kit looks pretty too!! Oh wow! You have no idea how useful this information is to novices like myself (OK, you probably do, which is why you wrote it and do what you do...) I'm planning and hoping to do a market in November for my [online] thrift store. All these bits of information help. I honestly cannot wait for you to bring your workshops to Johannesburg. Are you still not sure a bout the dates? I'd like to start saving and have my cards ready by then. Also, please don't do a venue in some arb place like Melrose Arch or something... LOL. PS: I agree with Nicola, your kit is pretty! I LOVE those old wooden cotton reels! Where can I find them?? ?